There May Be Something To This…..
For those who read my Race Day Recap post, you know that I said that I tried something new with my run. Yes, I know you shouldn’t do anything new on race day. I get that, but I wanted to run with a friend. So I did. What did I do? I walked! Say Whaaat??? What do you mean walked? Well, just what I said. I walked. I also ran and then I walked again. My friend swears by this plan. The plan apparently is from Jeff Galloway who apparently is a really big deal. How do I know this? Because my friend told me. I’ve learned that he not only has written books on running, but was also an Olympian. I feel he might deserve more investigation on my part. Now to me the concept of walking when I’m supposed to be running just doesn’t seem right. I’ve done it, but only with guilt. I’ll be honest – One of the reasons I did this with my friend besides wanting to finish the race with her is because the thought of being allowed to walk without guilt after swimming and biking seemed really good. So I did it and still had a great run in 27.55 minutes. So I thought I would give it a try today on a non race day. Now that the Tri is over (boo hoo), I’m back on my Hat Trick training plan (yeah). Today I has scheduled an “easy” 5 mile run. So I thought, why not? Nothing ventured. Nothing gained. And again the thought of being allowed to walk sounded good. Laced up and off I went. You know what? It worked pretty good. I was basically better or the same time as my other training runs and I probably walked for 5 minutes. Not bad for just 2 days after a Sprint Triathlon! I had good splits. Whaaat??? Hmmmmm, how is this possible? This really does need more investigating on my part. I may even have to buy his book. I do know though that I did push myself for those 3 minutes because you really can endure anything for three minutes. Then I was looking forward to the walk buzzer. So I’m sure if that is good or what. Either way, I am happy my run today. 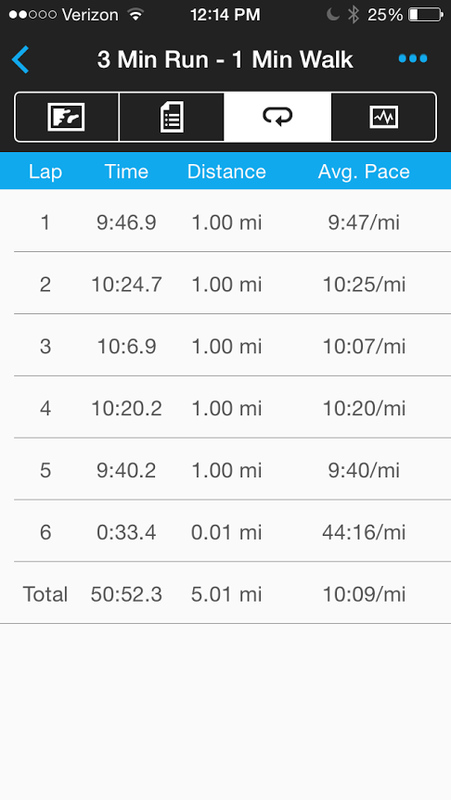 A run that I really didn’t feel like doing. So now there is another option…..